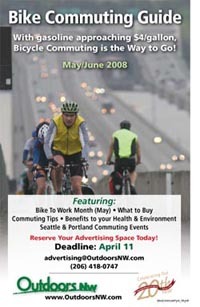 With gasoline pushing $4/gallon, Seattle-based Outdoors NW magazine is publishing a Bicycle Commuter's Guide in its May/June edition to encourage cyclists to take to the streets. With Seattle and Portland leading the way in bicycle commuting, Bike to Work Day in those cities is turning into a year-round habit. Advertising information for this special section may be obtained by emailing: advertising@OutdoorsNW.com. Deadline is April 11.